This was the first time experimenting with quinoa flour. 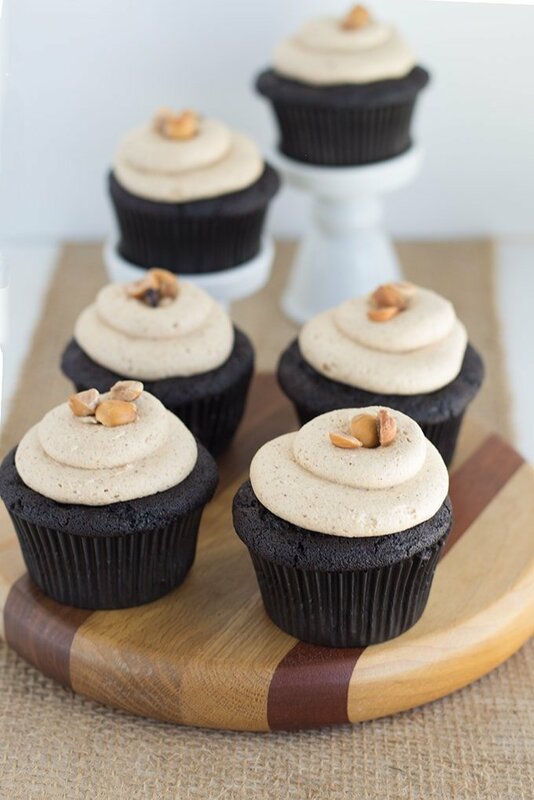 So, of course, I went with dark chocolate quinoa cupcakes with hazelnut buttercream! I had read that quinoa has a nutty flavor. I have to agree, it does have a nutty, almost smoky flavor. 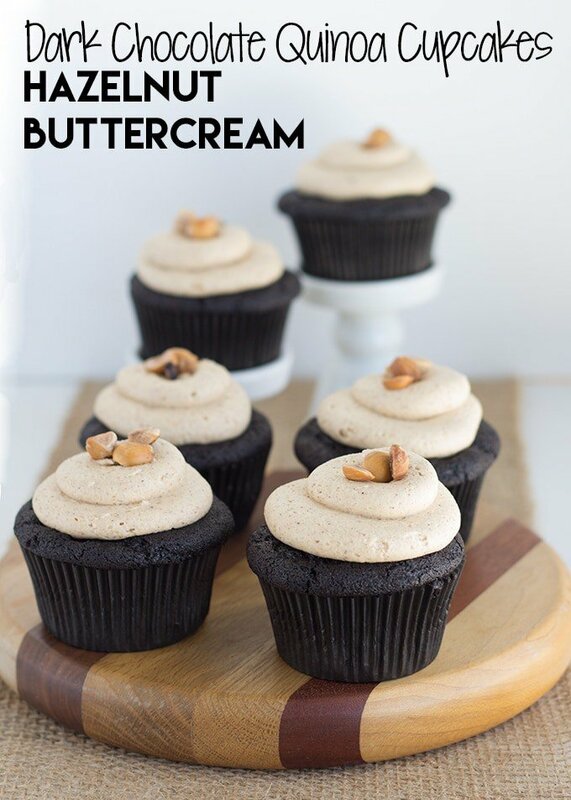 It pairs well with the dark chocolate and hazelnut buttercream. You know what else this quinoa flour has? A hefty price tag. Ah well, I couldn’t find anything other than organic, but it definitely was a splurge item. I’m glad I gave it a try though. It was an unique, but delicious adventure! I have to laugh at my son. He loves cupcakes so much. As soon as he sees a baked good being made, he’s nagging for a taste or bite. He wanted one of these so bad, so I sat him down at his little table and took off his shirt to keep it half way stain-free. I went back to work in the kitchen. 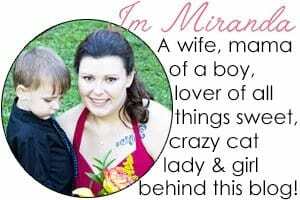 When my husband came home for lunch, he wanted to know what on earth had happened at Lucian’s table. His description was,”it looks like a cupcake exploded.” It was all true, very true. I’m still not quite sure how toddler’s are capable of such messes in a matter of minutes, but it happens a lot in our house. 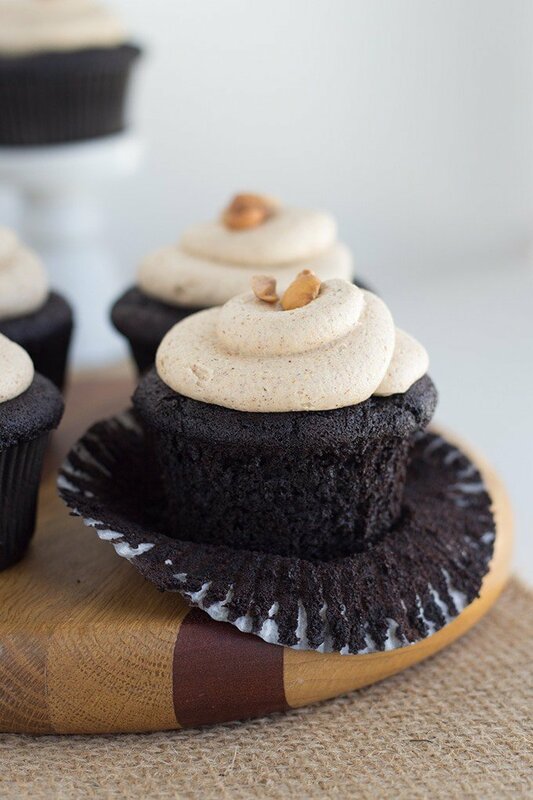 Dark chocolate quinoa cupcakes with a roasted hazelnut buttercream. Preheat oven to 350 degrees. Line a cupcake tin with baking papers. In a large mixing bowl, add in the butter and sugar. Mix on medium until light and fluffy. It should take about 2 minutes. Add in the vanilla and eggs one at a time. Once the first egg is completely mixed in, add the second egg and mix until incorporated. Mix in the buttermilk on low speed. In a separate bowl, sift the cocoa powder, baking soda, baking powder, and quinoa flour. Mix half of the flour mixture into the butter and sugar. Beat on low until combined. Add in all of the hot water and continue to mix on low until combined. Add the remaining flour and beat on low until incorporated. Fill the cupcake liners three-fourth full. Place in the oven for 27-29 minutes or until the cupcakes are done. Place a toothpick in the center of the cupcakes. If it comes out clean or with moist crumbs, the cupcakes are done. Let cool completely and start roasting the hazelnuts. Place the 3/4 cup plus 2 tablespoons of chopped hazelnuts on a jelly roll pan or any pan with raised edges. Make sure they're spread out. Let the hazelnuts roast for 10 - 13 minutes minutes until golden brown. Once you start smelling the nutty smells from the oven, they should be almost done or done. Let the hazelnuts cool. Set aside the 2 tablespoons of roasted hazelnuts for the tops of the cupcakes. Add the 3/4 cup of hazelnuts in a food processor. Process on high until the hazelnuts are almost completely smooth. Add in the powdered sugar and mix until the paste is smooth and the powdered sugar is incorporated. In a large mixing bowl, add in all of the hazelnut paste. It should be about 1/2 cup. Mix until fluffy. Add in the vanilla, powdered sugar, and 1 tablespoon of milk. Mix on low until combined. Turn the mixer on high and mix for another 2 - 3 minutes until light and fluffy. If it needs more liquid, add the additional 1/2 tablespoon of milk. Place the buttercream into a piping bag with a round tip or coupler. Pipe a nice dollop on top of each cupcake. Sprinkle the tops of the cupcakes with the remaining 2 tablespoons of hazelnuts. Have you ever tried quinoa flour or quinoa for that matter? I would love to know if you have and what your experience was with it! Thank you! The quinoa really gives this recipe an interesting flavor! Give it a try and let me know how you like it! Thank you, June! It was definitely a different flavor, but quite pleasant. I should try grinding up the quinoa and making another dessert! I have to check out this recipe that you speak of. I hope it’s up on your blog! wow these sound incredible! I love the idea of using quinoa flour in this. I wonder if I can just make my own with the quinoa I already have because I don’t want to wait until I can go to the store to make these!! 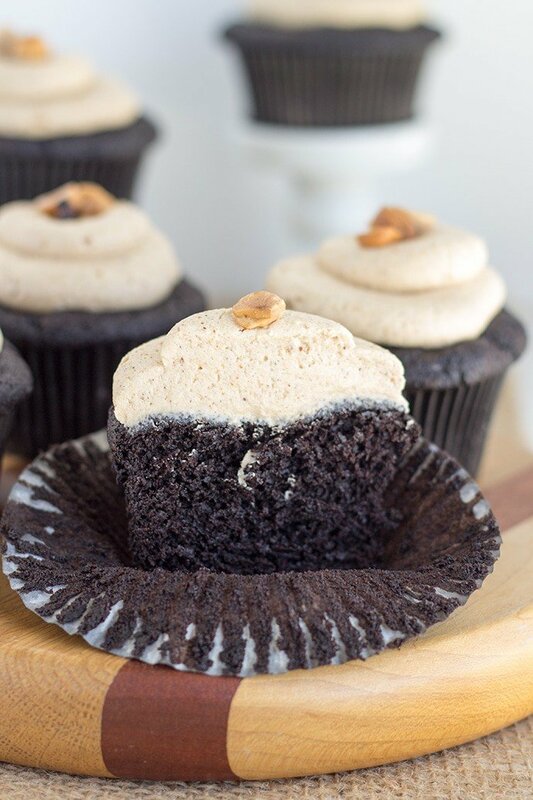 I haven’t used quinoa flour yet, but these cupcakes seem like a really good reason to change that! Chocolate and hazelnut is my all-time favorite dessert combination. I hope you give them a try! 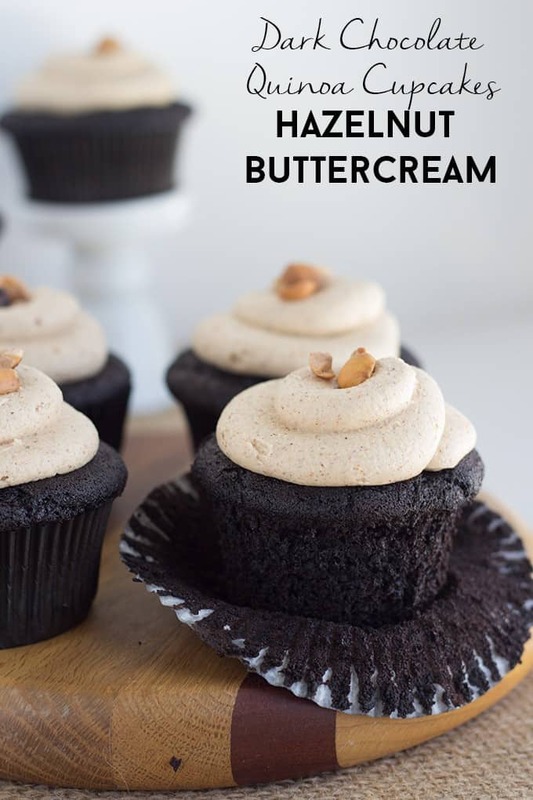 I can’t stop raving about this buttercream! Wow, for your first quinoa flour foray, these look like they turned out amazing! These look delicious! I am intrigued by the quinoa flour! They were! You have to try the flour! It’s such a different flavor. I’ve made a variety of grain flours with my Blendtec blender, but I’ve never tried quinoa flour before – I will definitely have to try it. These cupcakes look scrumptious! Thank you! I would love to try making my own flours. I think I need a Blendtec blender! I’m not really positive since I haven’t tried it. If you give it a try, I would love to hear your results though. You could grind up uncooked quinoa and use that. The first time I made a quinoa cake my family was totally skeptical. I think everyone was surprised at just how moist and yummy it is. 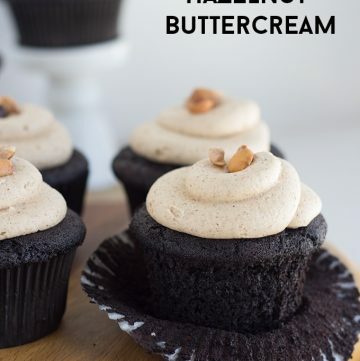 These cupcakes look absolutely heavenly and I’m a total sucker for hazelnut! Thank you so much! My hubby was skeptical too. Luckily, he can never resist a cupcake! Those are just gorgeous! I am in awe of your frosting!